Two interior views of the Harwell Hamilton Harris House in Beverly Hills. Through the lens of my architectural education from Cooper Union, the primary focus of my work has been residential interior design. I seek to cultivate with every client an authentic language of design that transcends the narrow bands of style in order to create a uniquely personal portraiture remarkable to each project, expressed through the selection of color,materials, furniture and objects. My intention as an interior designer is to give voice to the intangible, intuitive, poetic and the practical; enhancing the sense of place within an architecture so that those living inside might feel a belonging. The practice of interior design has also meant the art of collaboration. Every design solution realized is a cooperative effort between client, architect, designer, builder and craftsman. The mystery of collaboration happens in the ever changing open spaces between people. The featured project is the renovation/restoration of a house in Beverly Hills, California, designed originally in 1947 by Harwell Hamilton Harris for Harold English. Harris, a California modernist who was inspired by Frank Lloyd Wright and Richard Neutra, realized his most prestigious commission in the house for English, heir to the United Gypsum fortune. I, along with architects Annie Chu and Michael Matteucci and landscape designer Jay Griffith, were the collaborative team responsible for breathing new life into a once beautiful, now aging, ruin. The house sat vacant for five years, having endured several ill conceived renovations in past decades as well as deterioration caused by water and neglect. We were called upon to re-envision the work of Harris and to create a modern environment which reflected the spirit of our clients who were young architectural enthusiasts with a substantial art collection. The architects were fully engaged in resurrecting the integrity of the structure and creating a new language of architecture compatible with Harris that would allow for changes to be made. They masterfully reconfigured spaces, designed new cabinetry and updated all systems to accommodate a new program, a new lifestyle. Spectacularly sited on a hilltop overlooking all of Los Angeles, Harris intended each room of the house to have a unique view of the surrounding canyons, cityscape and ocean. The strong visual link between inside and outside informed the color palette I developed for the house and its furnishings. 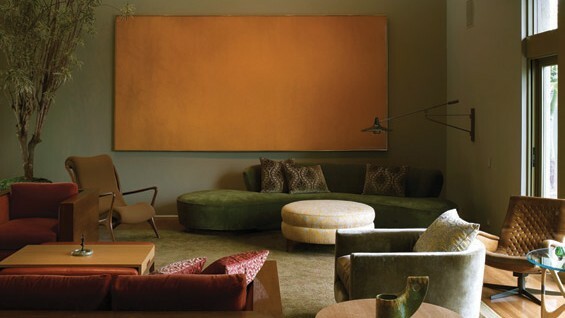 The greens, browns, reds, orange, lavender and gold colors of this particular landscape fill the house. Color—and the system of its application—acted as a kind of structure which reinforced the architectural detailing throughout. The formal feeling of the house was balanced by the accessible nature of the palette. The intensity and saturation of the wall colors provided a strong, suitable backdrop for the art of Morris Louis, Jules Olitski, Helen Frankenthaler, Kenneth Noland, David Hockney, Wallace Ting and Sam Francis. The rugs I created with V’Soske were designed to anchor and animate each space in response to the architecture and art. The furniture is a collection of vintage pieces by Vladimir Kagan, Robsjohn-Gibbings, Paul Frankl, Gio Ponti as well as pieces I designed specifically for the house with furniture designer and craftsman David Albert: an assemblage intended to create harmony and comfort. My love of color, passion for materials, ability to read the essence of a space, confidence in the poetic and alchemical, strength as an artist—all essential skills cultivated during my time at Cooper—served me well. The project continues after ten years and remains a work in progress. 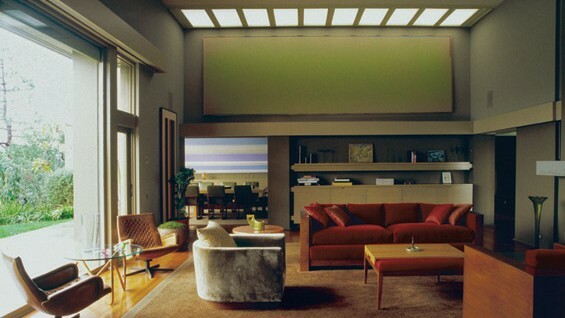 In 2006, we received the National AIA Interior Architecture Honor Award.